Recently, CNEWA led a pilgrimage to the Holy Land along with members of the Catholic Women’s League of Canada. One of our aims was to encounter the local Christians. In Haifa, we had the privilege of hearing the story of the “House of Grace” from the founders’ son, Jamal Shehade. CNEWA has partnered with the House of Grace for many years, supporting their various initiatives. The House of Grace began 32 years ago as a humble ministry of Kamil and Agnes Shehade. Shortly after they married in the early 1980’s, the Shehades began to take in ex-convicts, providing a home for them in their small two-bedroom apartment. Eventually, their ministry grew into an abandoned church that they renovated and named the House of Grace. Mr. and Mrs. Shehade had five children, who also lived with these former offenders. They grew up treating them as a part of their family — and, at times, even babysitters. It is a difficult transition for those released from prison, as they are often ostracized by society and can easily fall back into negative behaviors. For many former prisoners at the House the Grace, it is the first time they are treated as human beings with dignity, rather than lowlifes or criminals. At the House of Grace, they are shown what a real “home” is like. People of different faiths — Jews, Christians, Muslims and Druze — live together at the House of Grace. They celebrate each other’s feasts and learn one another’s traditions. Eventually, they begin to understand and respect each other, even if they don’t always agree — which is rare in a society where there exist many deeply held prejudices. We heard from one House of Grace resident who says their ministry has given him a new lease on life. He is very thankful to the people who gave him support and helped him to look positively toward the future. He has since obtained employment in construction, and is now focused on building a better life for his family. We also learned that the House of Grace has a Canadian connection. As a young person, Kamil Shehade spent a year and a half at the Madonna House apostolate, a house of hospitality in the small town of Combermere, Ontario. Archbishop Joseph Raya sent Mr. Shehade to Canada when he noticed that the young man was going down a dangerous path in life. This experience greatly influenced Mr. Shehade — in his faith and in his attitudes toward community and the people within who are marginalized or reviled. A few years ago, I spent two weeks at Madonna House. So I understand the ministry of the House of Grace, because it has the same open-door warmth that I experienced at Madonna House. Unfortunately, Kamil Shehade died of cancer in 2000. He was only 46 years old. But his wife Agnes and his children have continued the work of the House of Grace with the support of staff and volunteers. Together, they live out the Gospel simply — with kindness and love, changing one life at a time. 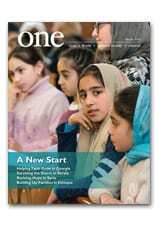 To read more about their inspiring work, see this article from ONE magazine.